The annual electricity demand in 2013 shows a reduction of 3.4%. All the electricity generated from renewable sources accounts for 38.5% of national production and 33.7% of national demand. Photovoltaic covers 7% of the demand, a world record. With the data from the last Terna Monthly Report of 2013, we are able to grasp the scale of electricity consumption and production in Italy. Compared to 2012, consumption is down by 11 TWh: the annual electricity demand was 317.1 TWh against 328.2 TWh in the previous year, showing a reduction of 3.4% (which becomes 3.1% if we consider that 2012 was a leap year). In 2012, the fall in demand compared to 2011 was 2.8%. 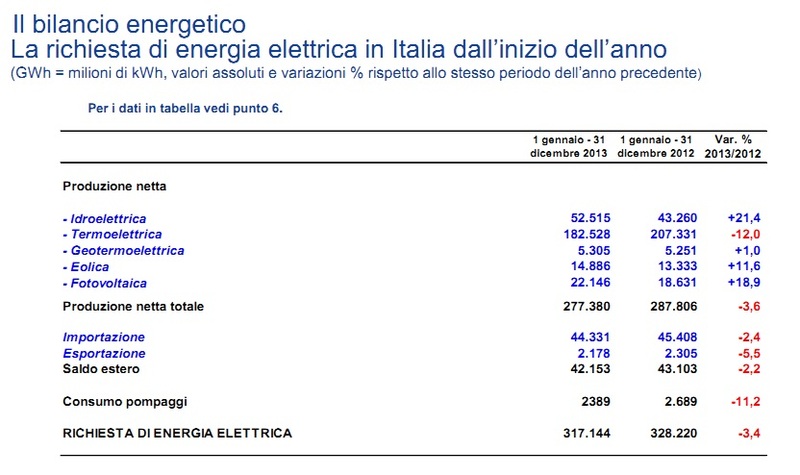 Since 2011, (demand at 334.6 TWh), the electricity demand in Italy has fallen by 5.2%. The 2013 decrease is significant, considering that December was the sixteenth month running in which there was a decrease in month-on-month electricity consumption (see graph of the percentage change in monthly electricity demand for 2013 and 2012). Again since the beginning of 2013, net production, equal to 277.4 TWh, has shown a fall of 3.6% compared to 2012. The foreign energy trade balance was also negative: -2.2% (42.1 TWh against 43.1 TWh in 2012). The economic crisis and the stall in the country's production are also summed up in the electricity demand data, according to the various territorial areas taken into consideration by Terna. Of the eight macro areas, seven registered a negative change in electricity demand in 2013; in Piedmont and Central Italy, the fall was significant, as was particularly the case in Sardinia (-16.4% compared to 2012). The only ‘non-negative’ sign, as can be seen in the graph, is for Lombardy. 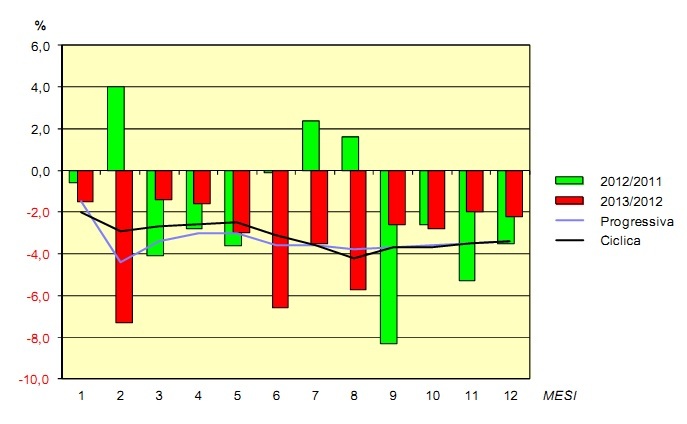 The element which most emphasises and best displays the fall in annual electricity demand is the slump in thermal-electricity production which, this past year, was 12% of that of 2012, about 25 TWh less; in other words, as if at least seven combined-cycle power stations, each of 700-800 MW, had simultaneously closed down. Apart from the fairly stable production of geothermal electricity, the other technologies are growing at double-figure rates: hydroelectricity, +21.4%; photovoltaic electricity, +18.9; and wind power, +11.6% (see table). All the electricity generated from renewable sources (including about 12 TWh from biomasses, entered under "thermal electricity"), about 106.8 TWh, accounts for 38.5% of national production and 33.7% of national demand. 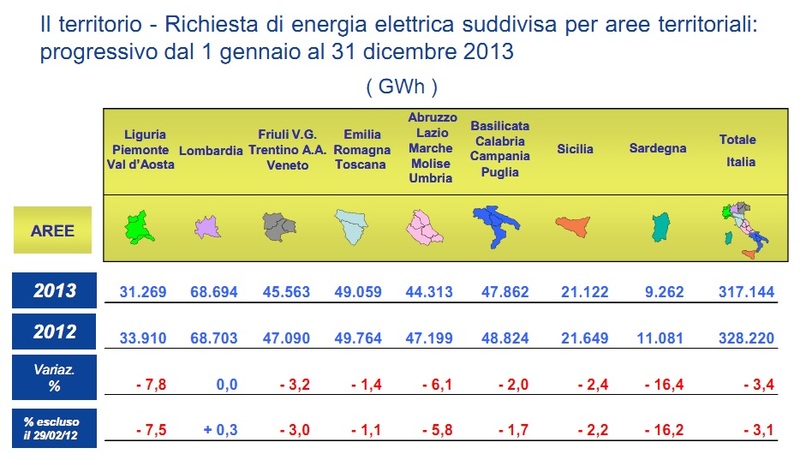 Therefore, more than one in three kilowatt hours requested in Italy today is produced by clean sources. Photovoltaic energy, accounting for 22.1 TWh, covers 7% of the demand, a world record, and 8% of production. Overall, electricity from renewable sources has increased by about 15.5% compared to 2012.